﻿ How to use Google Docs? The basics. How to Fix Google Docs Removing All Formatting and Context When Pasting Content into a Document, Images, Links, Text Formatting, etc. 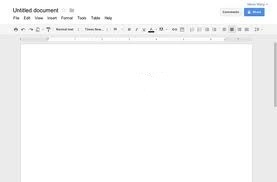 We are starting with a new series of articles devoted to Google Docs. The online office suite is one of the best solutions of its kind that shapes up to be a big trend in the computing industry. Today we'll cover the basics - what are Google Docs, how do they work, and what are the advantages and disadvantages of using them. Online office suite - what is it? While using Google Docs, you can enjoy all the well-known benefits of using online applications. The most important advantage is that the services aren't tied to a specific computer. Contrary to Microsoft Office or LibreOffice, there's no need to download and install the applications on a computer. You do not have to carry an USB device with you. Any computer connected to the Internet can access Google Docs and we can access the same file from any place in the world. All you need to do is create a Google account (all Gmail users have it) and log on to your computer. Another worth noting advantage is that multiple users can work on the same files at the same time. Browser services, however, do have several drawbacks. You have to be constantly connected to the Web and the applications don't have all the bells and whistles of their desktop counterparts. While you do not have to remember to update the services, you cannot take control over this process. If you do not like the current version, still you are supposed to use it. Google Docs is often updated, and Google constantly adds new features and capabilities, so that they do meet basic user needs. From 26 April 2012, all Google Docs files are stored in Google Drive. It is a virtual hard drive that allows you to store files online. The user has 5 GB of storage space with an option to purchase more space. Google Docs is part of Google Drive. Both applications provide a common interface. 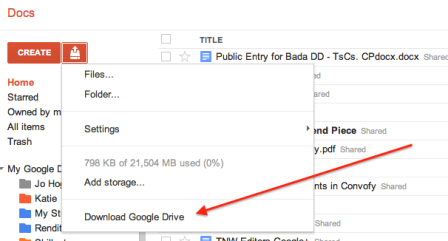 Google Drive lets users easily upload any kind of files. If a file is recognized by the service, you can open, edit, and share it and the other way round. Files stored in a Google Docs format can be exported to other file formats, including DOC, XLS or PDF. Both Google's services have been partially integrated with Gmail. You are allowed to open files in MS Office Documents in your mail client. It brings a Quickview option (cannot be edited) and the ability to open files in the Office Suite (with saving on disk). This function does not work with LibreOffice files. When it comes to PDFs, you can only view them. Google Docs offer a collection of applications that make it easier to produce documents, spreadsheets and presentations. All the components will be briefly described in the following parts of our series. At first blush, we can see some similarities to MS Office and LibreOffice. In addition, users are able to create folders in order to group and organize files. Next to the Create button there is an Upload option that lets you upload to Google Drive from HDD. On the left you can find the sidebar. ‘My hard drive’ directory stores files that you have created. Below, there is a folder with files which our friends shared with us. The following items provide access to recently modified files, trash and a log that records yours and your collaborators actions. In the upper right corner of the main interface, the service provides sorting options, view, and the application itself. Once you created a document or clicked on an existing one, editing panel is loaded in a new browser tab. You'll find there the menu and toolbar similar to that of Word or Excel. If you select the file (the box next to its name in the list), you will be presented with a list of buttons that help you delete, share, or transfer the individual elements. Of course, you can select multiple files at a time – you do not have to keep the Control key. Google Drive and Google Docs belong to a small group of web-based applications that offer offline mode, which allows you to work without the Internet. The left sidebar lets you access this function. First of all, set up for Chrome. Unfortunately, Firefox or Internet Explorer users may be disappointed since offline mode works only in the Chrome browser. Then, click Set up Docs offline and the Drive saves the entire content on HDD. 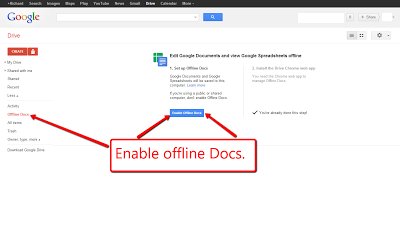 Offline mode in Google Docs is especially useful while traveling or if you’re in a place wich lacks Internet connectivity. When you get back online, your changes will be automatically synced with the online service. As you can see, Google Docs does have several features that set it apart from the rest of the pack. None of the applications within the Google Docs suite are able to beat the leading desktop productivity suite, but they still serve the purpose. We will discuss this theme in the next article, which will be devoted to the most popular Google Docs component , namely the text editor.